Understanding pavement and why it breaks down is the best way to design an asphalt maintenance program for your community. Pavement is made up of aggregates, which are the sand and rock, and binders or the glue is made up of asphaltenes and maltenes. Of all of these products, the only one that is subjected to degradation from oxidation is the maltenes that literally start oxidizing from the moment the products are mixed together at the asphalt plant due to the high heat of the environment. Most of the surface treatments on the market today are designed to coat the surface of your pavement and provide a sacrificial surface in hopes to add life to your pavement. These products are water-based asphalt or coal tar emulsions and are best known as sealcoating. Sealcoats are some of the original surface treatments designed in this industry back in the 1930s to prevent oxidation and deterioration of our pavement. What a lot of people don’t realize is that asphalt maintenance took on a different role in the aviation industry in the 1950s that is starting to change the way pavement is maintained in residential properties. When planes used aviation gas and a fuel spill would occur, there was no problem with having sealcoating on the pavement as the aviation gas would evaporate and cause little to no damage to the pavement. When the industry switched from aviation gas to jet fuel, the FAA and military started to see degradation to their pavement as the jet fuel would eat at the binders of the asphalt and cause large chunks of pavement to break away from the tarmac. These chunks of asphalt, also known as FOD (foreign object debris/damage), would then be sucked into the jet turbines causing damage to engines, which in turn could cause detrimental effects on your travel plans. In today’s world, there are now only specific types of products that are used on airport runways, and a majority of these products are known as asphalt rejuvenators. In the 1950s, two products were created at the request of the Army Corps of Engineers and the Air Force to prevent FOD damage and prevent premature degradation of the pavement. One was a clear product called Reclamite and the other product that had a blackening agent was called Pavement Dressing Conditioner Bituminous Pavement Rejuvenator or PDC for short. These products had a very specific design request and performance expectation that was needed and Brown, McGovern, Rostler, and White determined that a best rejuvenator would be: “A material that will significantly lower viscosity, increase penetration, lower softening point, and increase the ductility of the binder without disturbing the binder’s ability to retain aggregate, and not significantly lower skid resistance.“ So, as you can see, it’s a lot more complicated than just turning your asphalt black! Now, jump forward in time 30 years later, and one begins to see that the asphalt rejuvenators, which were designed for the FAA and military, are now starting to make appearances in industrial and commercial properties as well as some major theme parks. It was soon discovered that even though none of these properties were landing planes on them, they were still reaping the same benefits that the FAA was! After the 1990s, we began to see asphalt rejuvenators specified in bid plans and designs that were not only looking for the same performance the FAA was but also wanting the aesthetic appeal that sealcoats provided. This is when the two original products take different turns. The clear rejuvenator became more desired by cities and counties for roadways with speed limits less than 40 miles per hour as there were some speed limitations. However, the product could be applied to the roadways and within hours, they could be opened back up with minimal interruption in traffic. Additionally, because the product was clear, the striping on the roadways did not have to be refreshed and, therefore, this became the desired product of most cities, states, and municipalities that met the criteria for eligibility. The other product, PDC, took on legs of its own as it was not restricted by speed limitations and provided fuel resistance and minimal effect on a surface’s friction course. PDC was not only applied to airport runways, but also major highways, race car tracks, industrial, commercial, and eventually residential roadways and parking lots. 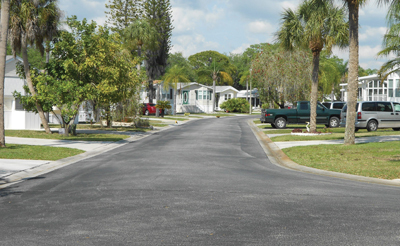 Its blackening agent appealed to the HOA communities, and when people started seeing it added life to the pavement, it became the most desired product around for properties that had untreated, virgin asphalt. So, what makes a property eligible for these rejuvenators? First off and most importantly is that the property must have untreated, virgin asphalt! If you are considering using a clear rejuvenator like Reclamite, make sure that your roadways are within the speed limitations of that particular product. Additionally, some of the clear rejuvenators have an age limitation, typically less than five years in residential communities and maybe up to three years of age in commercial/industrial. The black rejuvenator PDC has no age limitation and has been applied to pavement older than 30 years of age with tremendous success. Clear rejuvenators can be limited to only one treatment, and reapplication is determined by the manufacturer as to whether or not it is safe to apply another treatment of their product. Their knowledge can save a life, so please don’t push the issue if you aren’t eligible for a particular product. Also note that clear rejuvenators most likely do not offer protection from fluid spills like hydraulic oil, motor oil, or gasoline, whereas products like PDC will not only stabilize the existing fluid spills but also provide protection from future fluid spills. 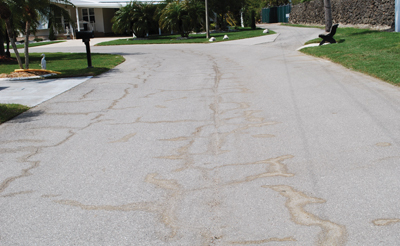 Even though a property might have untreated asphalt, there are other signs that might make them ineligible for rejuvenation as well. If a property has extremely thin pavement and there are signs of sub-base issues, the product should not be applied. The reason for this is that PDC softens the binders during the curing process, so if the pavement is too thin and cracked, PDC can actually accelerate the failure of the binder as it penetrates over ¼ of an inch. We limit our pavement thickness to a minimum ½ inch, however, some contractors might not have the same limitations so please be careful. In some cases, while working with communities that had severe base leakage but still wanted to preserve their pavement, the community was forewarned that they might not like the end appearance and they understood completely. If you have base pumping while your pavement is untreated and grey, you might not notice the issues. However, as soon as you make the pavement black, the aesthetic appeal can go out the door! Please note that whether you are using a water-based sealcoating or an asphalt rejuvenator, the same undesirable affect will occur as the contrast is so drastic. Editor’s Note: A select number of terms are provided to better understand asphalt maintenance. 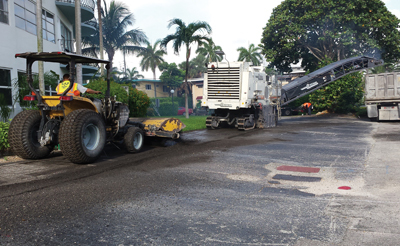 Milling—the grinding and removal of the existing asphalt cap to remove defects, such as dips and rutting and also provides a “grip” course for the next asphalt cap. Overlay—when a one inch thick or more asphalt cap is added to your pavement. Rejuvenators—Oil-based or maltene-based products designed to penetrate the asphalt cap and recondition the binders that have been lost due to oxidation. Sealcoating—Water-based coal tar or asphalt emulsions that are applied to pavement to prevent premature oxidation. Known as a “sacrificial surface,” these products are over applied for aesthetic appeal and typically are notable by their chicken wire cracking that develops with frequent application. Sub-base—this is the material that is located just under the asphalt cap. It can be lime rock, clay, soil cement, durarock, or a mixture of all depending on where you are located. If a property meets all the criteria to begin an asphalt rejuvenation program, an information packet is sent over for the board to pick through on how to notify their residents and what to notify them about. In a neighborhood with homes, we notify the residents to sand their driveways to avoid tracking whereas with a condominium association, the maintenance personnel usually takes care of the sanding and the notice is removed from the packet. An overview of the property is also included and how we plan to work their project. This keeps everyone in the loop and therefore minimal errors occur. No matter what, communication with your residents will make for the best project when everyone is informed of the same thing! Make sure that if your property has areas of repair that they are corrected at least 30 days in advance prior to the application of any type of surface treatment. When a community applies an asphalt rejuvenator to their pavement, don’t be surprised if the contractor delays the striping for 7 to 10 days after the treatment, as the paint could be pulled in with the rejuvenator. In some cases, restriping 30 days later may be required. Another big concern is working with rejuvenators that aren’t really asphalt rejuvenators. As sealcoating becomes more and more obsolete and asphalt rejuvenators take the lead, some manufacturers play on the word “rejuvenator” meaning to enhance or rejuvenate the visual appeal of a community and not necessarily rejuvenate or replenish the maltenes that have been lost due to oxidation. Other rejuvenators can be very dangerous if the contractor is not familiar with how to work with them. Specially-designed equipment needs to be used that regulates the application of the rejuvenator as applying too much could actually cause severe damage to your pavement almost to the point that it needs to be replaced immediately. Contractors that don’t want to invest in the equipment have been known to try and use sealcoat rigs to apply the product only to find that it was too high of an application and the material cannot cure! This then causes the binders to be over conditioned and the pavement begins to fall apart prematurely. When investigating contractors, be very leery of the ones that have been applying rejuvenators in your state say within the last decade. Make sure to ask for references that stagger from recent and then at increments of one year, three years, five years, reapplication, and then a 10 year mark. Floridians are subjected to “visiting contractors,” and it’s not up to us to teach them how to use their products in our environment at your expense. Make sure to visit Sunbiz.org to see if a contractor is a registered Florida business, but also be suspicious if it shows their officers located in other states. Incorporating in Florida with a PO Box does not make for a Florida contractor! 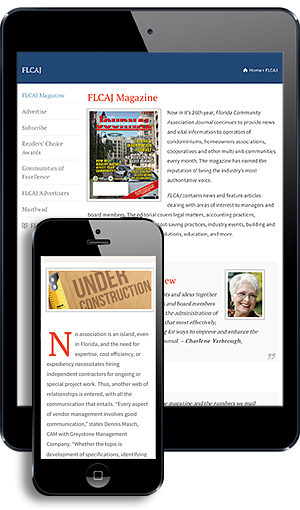 President, Asphalt Restoration Technology Systems, Inc.
Asphalt Restoration Technology Systems, Inc. (AR Tech) has been established in Florida since 1993. Connie Lorenz is President of AR Tech and has been with the company since 1999. Her leadership skills and classes have taught thousands of consumers about proper asphalt maintenance and has helped save them thousands of dollars, and she has become an advocate in the industry focusing on protecting homeowners, property managers, and owners from the downfalls of questionable contractors and improper techniques. For more information, visit www.asphaltnews.com.